The third official release by Lebanese electronic artist Jawad Nawfal sees him revisiting familiar themes and musical landscapes, while displaying the possibility for some radical departures in the near future. ‘Unholy Republic’ is the third installment of what is commonly referred to as the “Fate trilogy”, one that saw the day in the aftermath of the war waged by Israel on Lebanon in summer 2006. The first two releases, ‘34 Days’ and ‘Black Tuesday’, were marked by ominous moods and atmospheres, sets of menacing clicks and glitches, and a random selection of radio samples and speeches that conveyed brilliantly the mind-set and feelings of the artist, regarding the crisis at hand. ‘Unholy Republic’ picks up where ‘Black Tuesday’ left, with a rambling, brooding track haunted by static, radio noise, and some politician’s vehement preaching. This is followed by two tracks of subdued electronica, reminiscent of Munma’s previous releases. ‘Engram’, in particular, nods prominently towards South American musician Murcof’s output for the Leaf label. 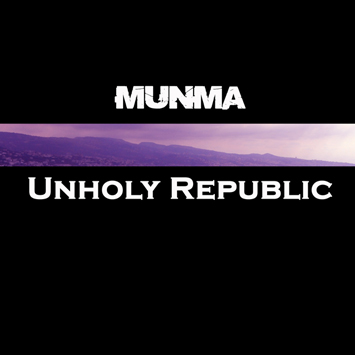 The rest of the album is more surprising, as Munma’s recent partner-in-crime, Nabil Saliba aka Trash Inc, enters the fray, and contributes his supple synth-enhanced melodies to ‘Broken Chime’ and ‘Deep Down Inside’. These show a different facet of Munma’s talent, and serve as a timely reminder that Jawad Nawfal is equally at ease devising ambient landscapes and dancefloor “stompers”. ‘Unholy Republic’ concludes on a short, ambient postcard entitled ‘Exodus’, signalling in the process the end of the “Fate trilogy”, and prefiguring realms of possibilities for Munma’s subsequent works. I find your music to be exquisitely distinct from other various well-known electronic music artists. Unholy Republic is how I was introduced to your music, let me say that it rings in my head over and over! it just never gets any better. I am highly interested listening to more of your music and I would like to know where I could find it. I am currently out of Lebanon, but I have friends there who share the same interest who would also be interested. you can get my albums at La Cdtheque in Achrafieh. It’s a very cool shop that sells most of the independent lebanese music. If you’re not in Beirut, you can order the albums from Toolbox Records, it’s a french internet shop that ships across the world. Just google it.